For more on cookies, please see here. 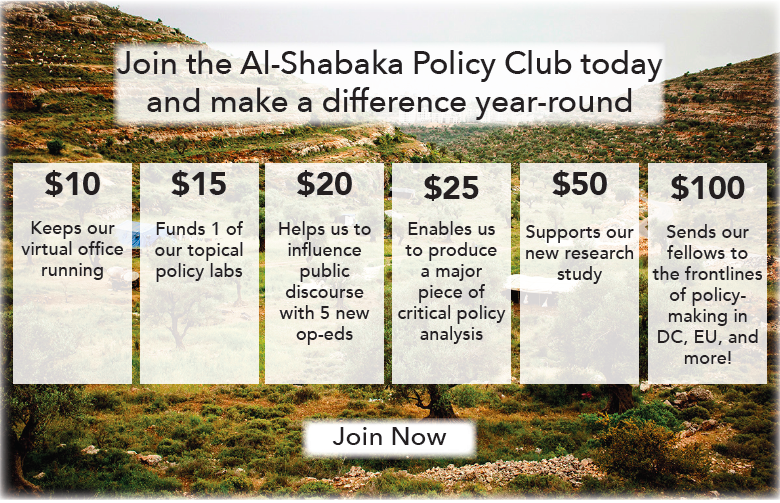 You provide data to Al-Shabaka when you sign up for our newsletter, make a donation, register for an event, follow us on social media, or through other online and in-person interactions. In these cases, we often ask for your name, address, email, phone number, and payment details (if you are making a donation). If we need to provide details to trusted service providers to undertake services on behalf of Al-Shabaka (for example, with the bank that processes your donations), this is done under contract, in compliance with strict Data Protection requirements. We will never sell your information to anyone. We do not share, trade, or sell email addresses with other companies or partners or use or disclose your information without your consent, except as required by law. We work with our IT company, website manager, and database system manager to ensure that we have up-to-date security features in place to protect your data. You can contact us at any time via email to change or update your details. You can unsubscribe from receiving emails from us at any time, using the unsubscribe function on the email, or by emailing [email protected]. We keep your personal information when we have an ongoing legitimate or lawful need to do so. When we no longer have a legitimate or lawful need to keep your personal information, we will delete it. For further information please contact [email protected]. At your request we will give you all details of personal information held about you by Al-Shabaka, once you have verified your identity. The materials Al-Shabaka publishes contain links to other sites. We are not responsible for the privacy practices or the content of such websites, and of course they have no access to our data. All Al-Shabaka materials may be circulated with due attribution to Al-Shabaka: The Palestinian Policy Network. The opinion of individual members of Al-Shabaka's policy network do not necessarily reflect the views of the organization as a whole. Al-Shabaka reserves the right to amend this Privacy Statement at any time without notice, and only the Privacy Statement that is currently in effect may be deemed effective.